Here's my Grandma Carson's blog. She's a painter. 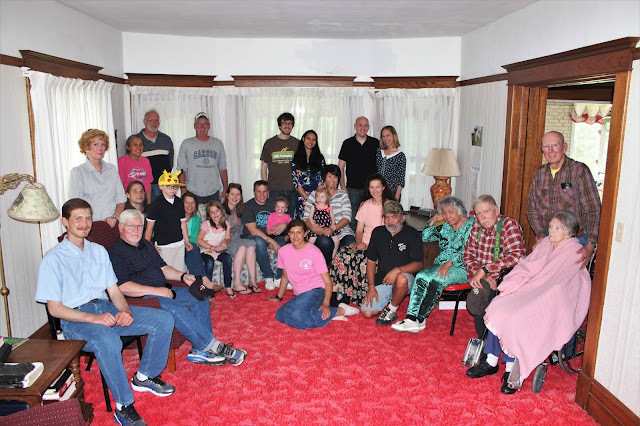 Yesterday a bunch of family members gathered to celebrate her birthday. It was a pleasant time in rural Ackley, Iowa. My heart is thankful. Grandma is in the midst of significant transition from her home on the farm to a care center. Her health and memory have been declining...and have declined more rapidly in recent months. Gathering together yesterday was very special, and I am grateful that Justin, Josh, Sweta, and I could attend. I am thankful for my grandparents and their family tree...the branches they inherited and the seeds they sprouted. As time goes by, I am ever-more reminded that we all have stories. We all have family trees. We all have closets and skeletons. We all have joys and sorrows. We have triumphs and glory-chapters when it all went well. We all have abysmal failures that we'd like to erase but can't. And so it goes for EVERYONE. It's not just you and your family. It's everyone and every family. We're all combination platters of the things we inherit - the choices we make - and the mysteries of the universe. Try as we might to understand it and make sense of it all, we never can completely - because we never have access to the full panoramic view. Instead, we catch glimpses of grace. And when we do....we breathe deep. We look not back. We look not forward. We just breathe and remember the only moment we really have is THIS one. So in this one...this very one...we breathe in, we breathe out. We breathe.